Carl Steffeck was the son of a father with indepent means. His father encouraged his interest for art and in 1837 he entered the master class of the horse painter Franz Krüger. He was Krüger's best pupil and eventually his successor. He travelled to several European cities to study in the studio's of the painters that worked there. In 1848 he finished his "Albrecht Achilles im Kampf mit den Nürnbergern um eine Standarte" that was acquired by the Nationalgalerie in 1864. His history painting "Der Sieger von Königgrätz" was completed in 1869 and bought by emperor Wilhelm I. In 1880 he was appointed director of the art academy in Köningsberg. He died in Königsberg in 1890 but he was buried in Berlin. 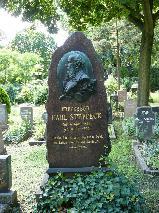 The grave of Carl Steffeck at the Französischer Friedhof, Berlin.